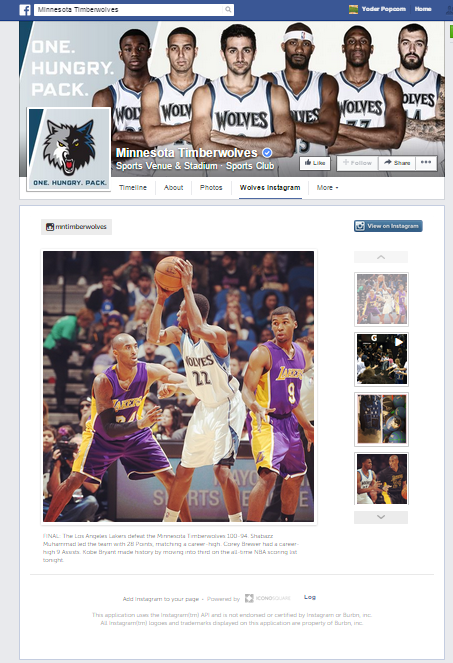 Create an Instagram tab on your Facebook Page! TabSite makes it easy to leverage the power of Instagram by creating a tab to display a brand's Instagram account photos or photos from a specific #hashtag. With user account photos, you can display your brand images from Instagram on a tab, and with hashtags you can empower fans to load their own images with the hashtag you identify and thereby pull in user generated Instagram photos. Page Admins have access to hide images from display on the tab to better control what items are displayed. With social sharing tools built in, including the ability to "Pin" images to Pinterest, the TabSite Instagram tab gives brands a way to easily showcase mobile photos on a PC and enable fans to share mobile photos connected to your brand all while sending traffic back to your Facebook Page! Available to all Platinum Plan TabSite users, this new addition to the TabSite Engagement App suite of tools makes it possible to bring the power of Instagram and other social sharing services like Pinterest together in once place, your brand Facebook Page. After clicking the Add+ button, the page will lead you to the App Builder section. Here, you can connect the app to your Instagram account through the use of the "Connect to Instagram" button. You can also set the look for your app in the drop-don menu below. There are two views to choose from; first is the Thumbnail and the second is the Standard Resolution. The Promotion Tools section is the third setting in which you are able to customize your app before linking to the provided social media platforms offered on the page. These sites are composed of Facebook, Twitter, Google+ and Pinterest. You can adjust the placement of the app to your own preferrence; it can be placed on the top, bottom or both. As the page administrator, take in-charge of the of the social networks you are connected with. Implement the engagement process specifically the Like and Share button of Facebook, pre-populate your tweets in Twitter, +1 some of the contents you like and pin some webpages/images you like with Pinterest. The second sub-setting for Promotion Tools is the Blog/Web Call-out Tool. With this tool, you are able to generate additional traffic to your fan page with the use of a promotional call-out. All you have to do is upload an image for your call-out, then, an automatically-generated embed code will display on the box beside the uploading area. You can then place this image to your own blog or any other sites online, in which if it is clicked by visitors, would lead them to your tab on Facebook. 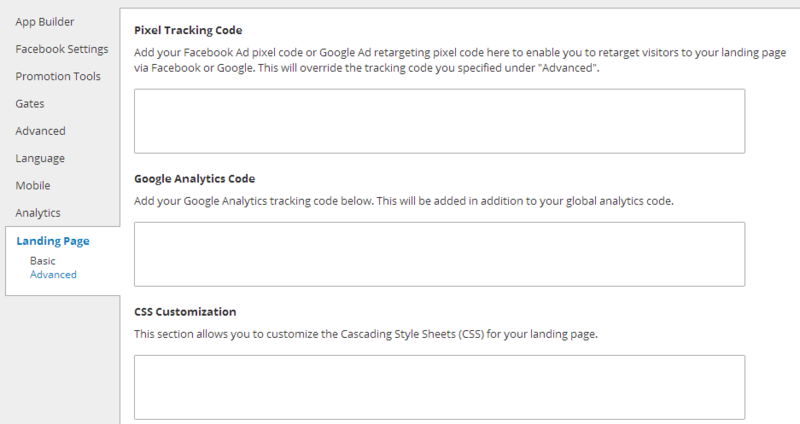 The Post Planning feature is the third sub-setting of the Promotion Tools section. It has three provided scheduling services namely Buffer, Sendible and Hootsuite. You will be able to schedule your posts to various social media sites and publish them as well. The URL it generates are in the form of a SMART URL which is compatible to both PC and mobile devices. The URLs direct you to the Facebook tab you have made. The Comment Sytem is the fourth one in the sub-setting list of the Promotion Tools. There is a single checkbox option called "Enable Comment System" in which if ticked, will display the added options underneath. These options are composed of "Allow visitors to sign-in to comment via" option where it allows us to sign-in to either Facebook or a Form before we can make a comment. You can also specify the addresses of users you would like to send alerts everytime a new comment is posted through the "Comment Notification Emails" option. 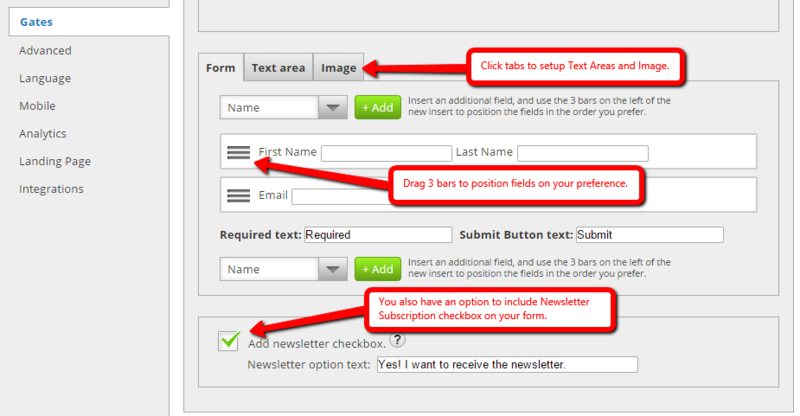 There is another checkbox which gives us the authority to approve the comments posted by the users. You are also able to manage the comments using the button with the same name underneath. The Language section is comprised of three sub-settings specifically Instagram, General and Comment System. The Instagram sub-setting of the Language section enables you to customize the text for your gallery on Instagram to suit your language and certain needs. Simply change the written text in the box with your own text version. The General sub-setting allows you to select your preferred language to use for your app. There are two drop-down button language options provided on the page, one is for the Like and the second one is for Tweet. Below these drop-down menus is the Share button text which is also customizable. Simply replace the current text in the field with your preferred text. The last sub-setting for Language is the Comment System where it is comprised of two sections; the Language Settings and Errors. You'll just have to modify the texts of each variable with your own style on the fields beside them. Don't forget to save them afterwards. There are two Global Options comprising the Mobile settings. The first one being the "Render desktop version on mobile" where it allows mobile users to gain access to the mobile-friendly alternative version of the app. On the other hand, the "Use like gate on mobile device" where it does the purpose of a Like Gate Image as well as display the same details. Note: Mobile Difference does not work to all apps. 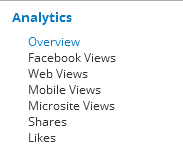 The last setting is Analytics. You can view the daily traffic that's entering your app as well as determine where this traffic is coming from. It is represented by several graphs specifically Overview, Facebook Views, Web Views, Mobile Views, Microsite Views, Shares and Likes. Click "Publish" to publish your app and go through the details of placing it to Facebook or a website.